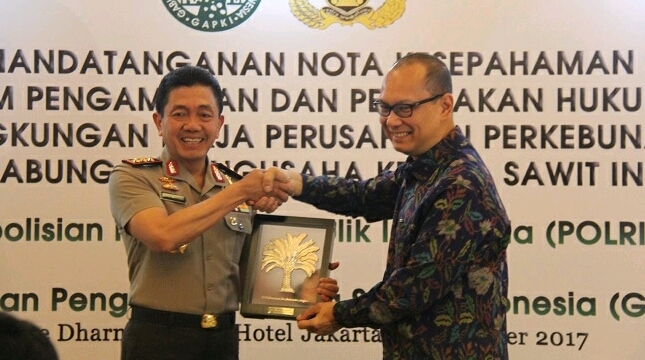 INDUSTRY.co.id - Jakarta - The Association of Palm Oil Companies (GAPKI) and the Indonesian Police (Polri) signed a memorandum of understanding (MoU) on the system of joint security and law enforcement in the work environment of plantation companies Gapki members. The signing of the MoU was represented by the Head of Police Security Maintenance Agency, Komjen Pol Drs Putut Bayu Seno and GAPKI represented by Togar Sitanggang, which took place in Jakarta on Tuesday (7/11/2017). Komjen Pol Putut Eko Bayuseno emphasized that the signing of the MoU is the first step of the future cooperation, which will be followed up with a strict guidelines. Then we socialize to Polda. Because this MoU will be meaningless if the Polda do not know. We'll do it together. Perhaps starting from the Police of many palm oil plantations, such as in Sumatra and also Kalimantan, said Police General Putut Eko Bayuseno. Meanwhile, Chairman of GAPKI Law Division Yunita Sidauruk, quoted the speech made by Chairman of GAPKI, Joko Supriyono said the theft of fresh fruit palm fruit bunches (TBS) is very rampant happened in almost all oil palm plantations. The theft of TBS continues unabated because law enforcement still has no deterrent effect. Yunita revealed one of the motives of TBS theft is also because of the extent of drug distribution up to the remote areas. Starting from not having money to buy drugs, Then stole TBS. Then released again because the value of the stolen item is not enough to hold or imprison the person because it is still included in a light criminal act. She said. The cooperation between GAPKI and Polri is expected to reduce criminal acts in the palm oil plantation, especially the theft of TBS and at the same time eradicate the chain of drug trafficking in oil palm plantations.